I am officially a working dog now! 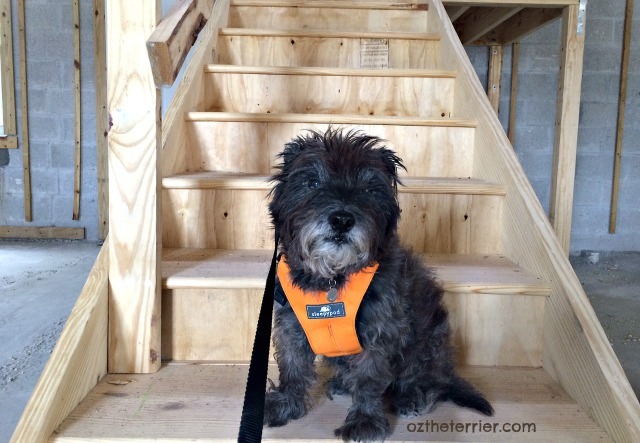 Daddy-dog has become a board member at our local Habitat for Humanity affiliate. He will be the Chair of Construction and I am his trusty-rusty construction dog. This weekend we went out to all the different Habitat construction sites to check on their progress. The above photo is of the last construction site we stopped at and it is sponsored by our good friends at JM Family Enterprises, the corporate home of Southeast Toyota. Daddy-dog and I drove in his Toyota Tundra, “Big Blue” to all the sites, and I of course wore my Sleepypod Clickit Sport safety harness. Even a working dog needs to be safe while driving around. I walked the entire site to check on the utility trenches and the site grade. I personally thought the site could use some final grading so Daddy-dog made note of it. These homes have huge yards so any dogs living in these homes are going to have lots of room to run and play, which is great! At a different construction site, I got to walk in and check out the trench for the French drain that will be installed. It was pretty deep and rocky but I enjoyed exploring. 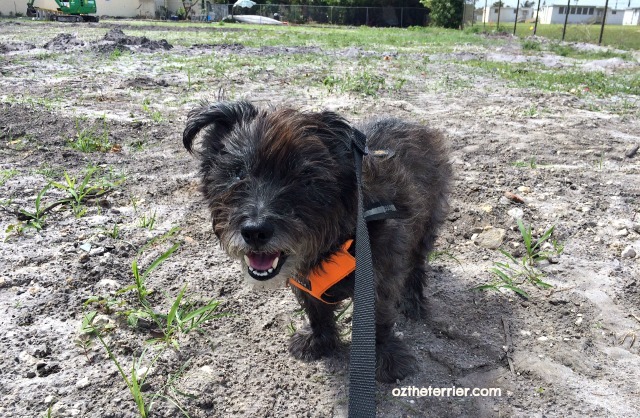 One of the things I love about my Clickit Sport dog safety harness is that it can be used for a walking harness as well. Since we were in and out of the truck so much, the Clickit Sport made it easy to go from being safe in the truck to walking the construction sites and then back into the truck again. 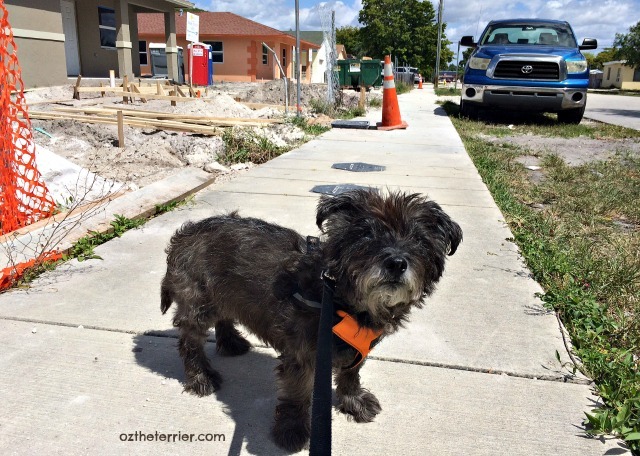 Daddy-dog and I also visited the site of Habitat Broward’s first two-story duplex. It is coming along a bit slowly but the exterior is almost done. The interior still needs some work as you can see. I did not like this staircase because there are no walls or railing yet to make it feel safe. I couldn’t wait to be buckled up back in the truck at this stop. I was Daddy-dog’s official working dog all morning. We checked on a total of 18 Habitat homes that are in varying stages of construction and made notes for his upcoming meeting. 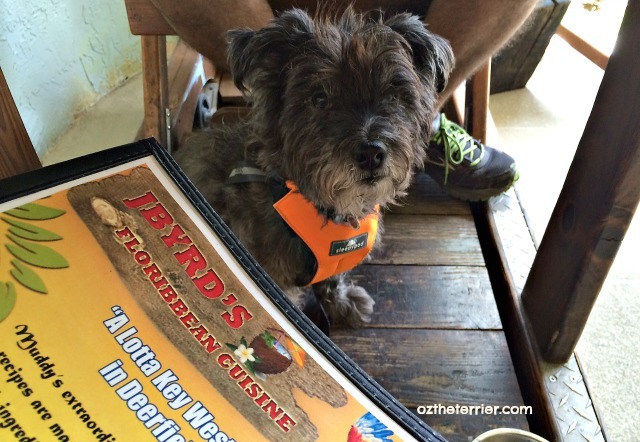 On the way home, we stopped at one of my favorite dog-friendly restaurants in Deerfield Beach, Florida – JByrd’s Muddy Waters. Their patio seating is always dog-friendly and the food is really good. I enjoyed a bite or two of some Conch Fritters and some Grilled Mahi Mahi and the nice waiter brought me a bowl of ice water. Hey…a working dog can work up a big appetite, you know?!? 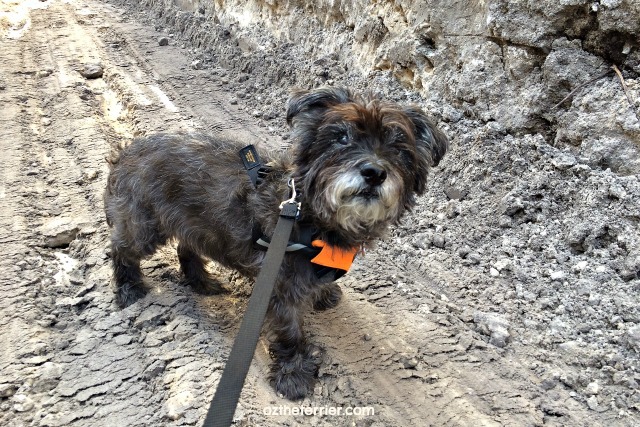 I enjoyed my travels to check the construction sites with Daddy-dog. I am so thankful that my Sleepypod Clickit Sport safety harness makes running errands like this a breeze. No having to change from one harness to the other, just unbuckle the seat belt and click on the leash and you are off and working. Don’t forget that today is National Pet Day, a day to celebrate the joy pets bring to their owners’ lives. It is also a day to raise awareness of the plight of many types of animals waiting for a forever home in shelters in rescues all around the globe. One of the best ways you can celebrate National Pet Day is to spend some quality time with your pet(s) today, like I did over the weekend working with Daddy-dog. Just remember, if you take your pet somewhere today, be sure they are secured safely in your vehicle. Be Sleepypod Safe! It looks like Daddy-Dog couldn't do it without you, Oz. The human's stepmother was on the board at Habitat for Humanity in Tennessee after she retired, and it is such a great organization. Paws up to you for helping them out, Oz. What a fantastic job! Betcha dad couldn't do it without you! What a totally wonderful way to spend the day!! Looks like you and Daddy dog got lots of work done, too!! PeeEss...Conch fritters sure sound nommy!! We want to say CONGRATULATIONS CONGRATULATIONS TO YOUR DADDY DAWG... THAT is wonderful that he is now on the Habitat Board. We know how much this means to Both of your peeps... they have done a LOT to help those who need a good affordable Home... BRAVO Congratulations and BRAVO..
OF COURSE, he could NOT do this withOUT your help Oz... we applaud you all fur what you are doing to help OTHERS.... you are WONDERFUL and LOVING and CARING !!! Way to snoopervise the Habitat work, Oz. Our seat belts double as a harness for walking too. It comes in handy sometimes. How cool for your Daddy Dog! and pawsome that you are his right hand dog. Mom & I have training class tonight - that is always quality time for us! That is important work for you and your dad to work on, O. It's great to have a harness that works for all the day's activities. Working dogs need to be extra safe! That bright orange is perfect in the contraction sites, Oz! Is daddy dog gonna buy you a hard hat? Safety furst you know! Happy National Pet Day! You had a fun and exciting day! Congratulations on your new job, Oz! We are glad you are traveling safely to your job sites!